People just listen – right? Well, if you are a mother of a young child, you know that people can hear – but they don’t always listen! There is a big difference! I like to laugh and say that children (and even some adults!) have selected hearing. That is – they hear everything but actually listen to or respond to what they want. My son could always hear me call him for dinner, but somehow didn’t hear me when I asked him to throw his dirty clothes in the hamper. Sound familiar? It probably does. Listening is a skill that can be taught to children. And it is an amportant skill for children to have if they want to succeed in school and get along with other people in their world. So it is definitely worth the time and effort it may take to help your child learn to listen when he is spoken to. First, you need to model the behavior you expect of your child. Life is hectic and adults are pulled in a dozen directions at once, it seems. We can be distracted or upset or just plain exhausted. 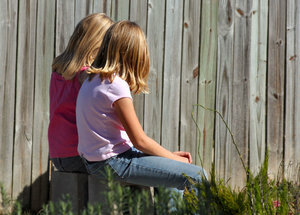 So when our child is speaking to us, we can unintentionally tune out while we mull over our own problems and concerns. Be aware of this tendency and make every effort to really listen when your child speaks to you. Bend down to his level and look at him when he is talking. Put the cell phone down, turn away from the stove, set aside your book – in other words, stop what you are doing and give your child your full attention. I have actually found that it takes less time to stop and listen to a child than it does to half-listen while they go on and on trying to get your attention. Repeat what you hear so that your child knows you were listening. This is also helpful because if you misunderstood your child, he can correct you. If your child approaches you at an inconvenient time, don’t pretend to listen when you know you can’t. Let him know that this is a bad time for you to give him your attention and let him know when (in the near future) you will be able to listen. Then follow up with him as promised. Children can get into the habit of ignoring parents, especially if they do not like what their parent is saying or asking them to do. And then parents, out of frustration, get into the bad habit of repeating and repeating and repeating their request in the hopes that their child will comply. A vicious cycle ensues – when the parent repeats requests his child knows he does not have to listen the first time – he’ll hear it again and again. And when the child doesn’t listen, the parent has to repeat and repeat. The trick is to break the bad listening cycle. Explain to your child that you have gotten into a bad habit that you want to fix. Let him know that you will clearly state your requests and that you expect him to listen the first time you speak to him. When you give your child a request, ask him to repeat it to you to make sure that he understands what you want. Next, be prepared to let natural consequences occur. For example, if you call your child to the dinner table and he does not come, let his dinner get cold or remove his plate along with the others when you are done eating and cleaning up. Children will be fine if they miss a meal, but I’m guessing that it won’t take long for your child to realize that you are not repeating requests. Just make sure that the consequences match the behavior. If your child doesn’t hear you ask him to put his clothes in the hamper, he will have to wear dirty clothes since only clothes in the hamper get washed. If he doesn’t put his homework away after you remind him once, he will have to explain to the teacher why his homework was left at home. You get the idea. 3) Help your child improve his listening skills. Once you identify that your child’s listening skills needs some work, there are concrete things you can do at home to help him improve his listening. For example, you can encourage your child to practice with following directions worksheets (or, for older children, with following multi-step directions worksheets). Also, you can plan listening games such as Simon Says. For information on helping your child develop important school-readiness skills, please visit Renee at www.schoolsparks.com for a < span=""> href=”http://www.schoolsparks.com/kindergarten-readiness-test”>kindergarten readiness test and free kindergarten worksheets. As the oldest child of 12, I'm a great listener. But reading this makes me realize, I could be setting a bad example. I can multi-task, listen and respond thoroughly while doing others. But I'm going to give this a try, stop what I'm doing to listen, so maybe this will help my fiancee! We learn more from what we hear than what we say! Love the topic. It makes perfect sense that if we expect our kids to listen to us, we need to model that ourselves! My kids are terrible listeners! It is probably my fault too. Thanks for sharing your tips, Renee!